TAILPIECE HOFNER. MADE IN GERMANY. Cordier Harpe style "Fancy Jazz" Guitare demi caisse. Zinc moulé finition Dorée. Zinc moulé sous pression avec support et axe de charnière en acier. fournis avec Vis. Mounting hole locations. 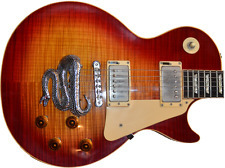 My parts are not endorsed by, or affiliated with Gibson® Epiphone® guitars in any way. Does not touch the surface of your guitar . 100% of every penny we receive goes to Animal Rescue! These Patented TailPeaces are specially designed solid Die Cast Light-Weight Aluminum creations made in the U.S.A. We're not simply gluing designs onto a "Bar". Goujons de pont Cordier guitare Stop / douille TB002, ensemble de 2. Model TB002. Para Stop Tailpiece. MPN No aplicable. EAN No aplicable. 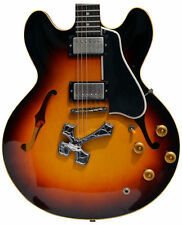 My parts are not endorsed by, or affiliated with Gibson® Epiphone® guitars in any way. Does not touch the surface of your guitar . These Patented TailPeaces are specially designed solid Die Cast Light-Weight Aluminum creations made in the U.S.A. We're not simply gluing designs onto a "Bar". Goujons de pont Cordier guitare Stop / douille TB002, ensemble de 2. Model TB002. Para Stop Tailpiece. Finition d'or. EAN No aplicable. Finish Gold. Cordier Harpe style "Fancy Jazz" Guitare demi caisse. Zinc moulé finition Nickel. Mounting hole locations. Cordier Harpe style "Fancy Jazz" Guitare demi caisse. Zinc moulé finition Chromée. Mounting hole locations. Style de TOM cordier en zinc dur. País/Región de fabricación Japón. chaudrons inclus pour plus, voir la photo ci-dessous fiche. EAN No aplicable. Style de TOM cordier en zinc dur. País/Región de fabricación Japón. chaudrons inclus pour plus, voir la photo ci-dessous fiche. MPN No aplicable. EAN No aplicable. Finition noire. País/Región de fabricación Japón. MPN No aplicable. EAN No aplicable. Finish Black. Producto no nacional No. País/Región de fabricación Japón. MPN No aplicable. EAN No aplicable. Artículo modificado No. Le cordier en gros est environ. Largeur (17 mm) Longueur (98mm), Espace entre 2 goujons (82 mm, du centre au centre). Couleur: noir. Le 04-mars-19 à 14:30:36 Paris, le vendeur a ajouté les informations suivantes . Relique GOTOH pièces de série sont fabriqués pour ressembler ans pendant la production. Principaux composants internes ne sont pas affectés par ce processus et conservent leur facilité d’utilisation et de durabilité. Will cette adapter ma guitare?. Cordier Jazz Manouche Busato Original fabriqué en France par le Luthier Maurice Dupont(Laiton). Modele utilisé sur les guitares Busato et certaines Favino. Modèle est en laiton. 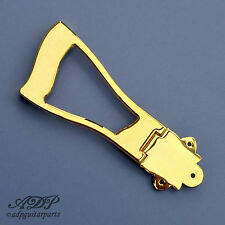 Jazz Manouche Tailpiece Busato Original crafted in France by Luthier Maurice Dupont (Brass). Cordier Jazz Manouche Busato Original fabriqué en France par le Luthier Maurice Dupont (Laiton NIckelé). Modele utilisé sur les guitares Busato et certaines Favino. Modèle est en laiton Nickelé. Jazz Manouche Tailpiece Busato Original crafted in France by Luthier Maurice Dupont (Brass). Not a good situation. At least it wasn't; we've taken care of that problem. This bracket is shaped and drilled like a trapeze bracket (so it installs using your existing holes), but it's got a hook on top to work with the R tailpiece. ACOUSTIC BASS RESONATOR TAILPIECE. Papa D's is based in famous Spa town of Droitwich, in Worcestershire & is owned & run by husband & wife team Andy & Marie De Looze. Andy De Looze has over 30 years experience in the music industry. If you've got a 6-string trapeze tailpiece on a 12-string guitar, you're probably tired of running two strings through each hole and putting up with the pinging, buzzing, and binding that result. We have the perfect solution for you. Not much to this one: it's a bog-standard 6-string trapeze tailpiece for a Rickenbacker guitar. The mounting bracket isnot included. Typically found on Les Paul / SG style guitars this tailbar has an overall string span of 52.5mm with the six string holes set deep into the rear edge of the tailpiece. The tail piece has a curved profile to match the curve of LP style guitars. 1930's Parlour-style Stainless 4-string Cigar Box Guitar Tailpiece - USA Made! 3 mounting holes in base allow easy mounting to back edge of cigar box. 4 evenly spaced string holes easily accomodate ball-end guitar strings up to. 056". Cut from. 024" stainless steel sheet and buffed to a brushed finish. This is a hinged tailpiece. 3-string Stainless Steel "Lone Star" Tailpiece for Cigar Box Guitars - USA-made! These tailpieces are 4" in height/length, and 2" wide, and almost always need to be bent to install. Mounting screws are not included, and you can drill the screw holes a bit larger if need be to accommodate larger screws. 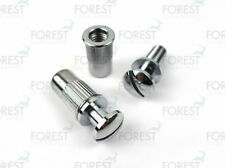 7 STRING GUITAR STOP BAR TAILPIECE. INCLUDING ANCHORS. Papa D's is based in famous Spa town of Droitwich, in Worcestershire & is owned & run by husband & wife team Andy & Marie De Looze. Andy De Looze has over 30 years experience in the music industry. These 3-string tailpieces were engineered specifically for use on 3-string cigar box guitars. 3 mounting holes in base allow easy mounting to back edge of cigar box. 3 evenly spaced string holes easily accommodate ball-end guitar strings up to. 056". This is the coveted long Accent bracket as used on the seminal 360F of the early 60's. Look at that shine (mirror-polished stainless, ya know). Look at those notes (in case you forget the song, I guess). 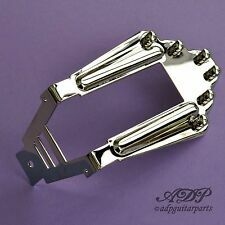 Acoustic guitar tailpiece piece heavy duty trapeze 115mm. Love the look of that "R" tailpiece but hate stringing it?. Don't really want to switch to a trapeze?. Or did your tailpiece just explode in the case leaving you knee deep in smithereens?. As Billy Mays used to say: "There's more!". Will this fit my guitar ?. Vintage '40s-50s USA Kay Harmony Archtop Guitar TAILPIECE ! CLEAN! 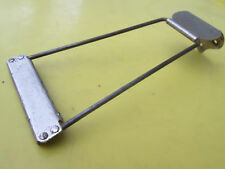 Vintage '30s-50s USA Kay Harmony Archtop Guitar TAILPIECE ! CLEAN! Vintage '30s USA Kay Regal Dobro Harmony DECO Archtop Guitar TAILPIECE ! CLEAN!